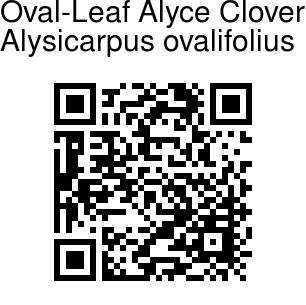 Oval-Leaf Alyce Clover is an annual herb, erect-spreading, 20-60 cm tall, with stem velvet-hairy. Leaves are unifoliolate, leaflets 1-10 cm long, 0.6-3 cm broad, elliptic or oblong to narrowly lanceshaped, pointed to notched, with a short sharp point, finely velvet-hairy, leaf-stalk 2-8 mm long, leaflet-stalk 1-1.5 mm long, stipules 0.5-2.0 cm long. 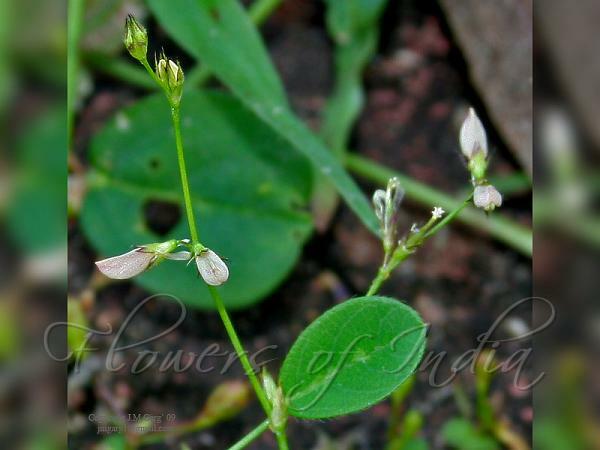 Inflorescence at branch-ends or leaf-opposed or paniculate, flower-cluster-stalk 3-4 cm long, axis 3-11 cm long, flower-stalk 1-2 mm long. Bracts 4-5 mm long. Calyx 4.5-6 mm long, velvet-hairy, teeth 3-4 mm long. Flower orange-buff to pink or reddish violet rarely whitish, Vexillum 4-6 mm long. Fruit 1.8-2.5 cm long, 2-8-seeded, not constricted, each 1-seeded part 2.5-4 mm long, 2.0-2.5 mm broad, finely velvet-hairy. Flowering: September-October.